Have you noticed the high price of fresh herbs in the supermarket lately? It amazes me why more people aren’t getting into the lucrative area of growing and processing fresh herbs. If you want to try your hand at herb farming, grow herbs that do well in your area. Start small, you can expand later with a green house, climate control and soil manipulation. You can begin with just a hot frame to start your seeds, and a screened area for drying your herbs away from insects and other undesirables. Do a lot of homework before you start your herb farm. Go to the library or bookstore and find out what are the needs of the herbs you plan to plant. After you know what herbs you will be planting on your herb farm go through the history of that particular herb. Also see if it has any folklore or medicinal uses attached to it. Make up little booklets with this information as a "give aways" with your plants, it makes it more attractive to the buyer and will add to your sales and profits. During your research, include study on which herbs attract pests. 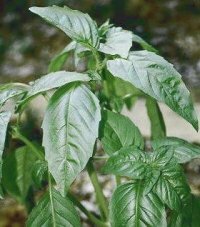 (Basil attracts white flies which are difficult to eliminate). Another trick is to keep herbs that attract pests away from the ones that do not on your herb farm. If you are proficient with your computer, make up nice labels for your herbs. If not, go to a printer and have them make them for you. When you get to the stage that you are shipping herbs, always put a little information on the herb in the package. It gives your package a personal touch and your customer will be more apt to buy again. Once you have a crop in, you will need to market your inventory. Go to Gourmet Restaurants and Gourmet stores. Don’t forget health food stores and caterers. Talk to the chef or owner and explain what you have. You may try to leave some of your stock at the establishment on consignment to get your customers to see the value of fresh herbs. Offer to set up a display with a poster for their window. Or offer them a "special introductory price". You may even know some people in your area that just love to cook and would be ecstatic if they were part of your route. Exposure is key at this stage for both your name and your herbs. Go back to these potential customers often to build up your reliability. Another important step is to write press releases that you can send to your local newspapers. Here is where the research on the folklore will come in handy. Use your gathered data on the folklore attached to herbs in the press release. These press releases will introduce you, and your products to the marketplace. Post them on the web as well, this will help you get customers from out of town. Be imaginative on the many interesting uses of fresh herbs and of course, how to find you as the source. You may want to set up a network with other herb farms to buy from, at wholesale prices. This way if you get low on some herb stock you have a place to obtain it for your customers. Remember, they are depending on you and you want to keep their business. An inexpensive way to advertise your business is to buy the magnetic signs that stick on your car door. Be creative, make people want to buy your products from YOU. So, jump in your car, go to the library and start studying on how to become an herb farmer. Happy Gardening! Copyright © 2006 Mary Hanna All Rights Reserved. Mary Hanna is an aspiring herbalist who lives in Central Florida. This allows her to grow gardens inside and outside year round. She has published other articles on Cruising, Gardening and Cooking. Visit her websites at Herb Gardening Cruise Travel Directory and The Secrets of Container Gardening or contact her at mary@webmarketingreviews.